Before the performance of Detour Guide that I saw began, a producer from Silk Road Rising came out to talk to the audience. Before the usual pre-show announcements, he began by acknowledging the terrorist attacks in New Zealand, the news of which had broken just that morning. The audience shared a moment of silence, and then Karim Nagi came onstage to tell us a story that sought, in all aspects, to humanize and demystify the Arab world. He delved into the music, culture, and history of Egypt, Syria, and many other Arabic-speaking nations. He analyzed portrayals of the Arab world in Hollywood movies and attempted to dismantle stereotypes. He told stories of his childhood, growing up in America as the son of Egyptian immigrants, and of his trips back there. Detour Guide is a screamingly necessary show in this political era, where racist and anti-Muslim stereotypes are being peddled by the most powerful people in the Western world to immediate and devastating effect, as the news that morning reminded us. This is a show that rightfully forced me to address and challenge my own biases. Nagi goes out of his way to make us uncomfortable, and make us examine why we like or dislike certain cultural narratives. As essential as the message is, there are some artistic stumbles here that cause the storytelling to suffer. As a writer, Nagi’s language is delightful, loopy and lyrical. However, his thoughts seem disorganized. Ideas are brought up and then promptly dropped, and so few sections of the show flow rhetorically into each other. The disconnect between anecdotes makes for awkward pacing, and as a result the 95 minutes pass very slowly. Nagi is clearly attempting to give us an overview of the Arab world through both a lens of history and of personal struggle — but because there’s little cohesiveness in how he weaves the story together, the audience leaves the theater with more of an aesthetic impression of this region than a historical or personal one. And that’s not all bad, because the aesthetics here are remarkable. When he’s telling us a spoken story, Nagi seems physically uncomfortable onstage. But when he begins engaging with us through music, his body absolutely comes alive. 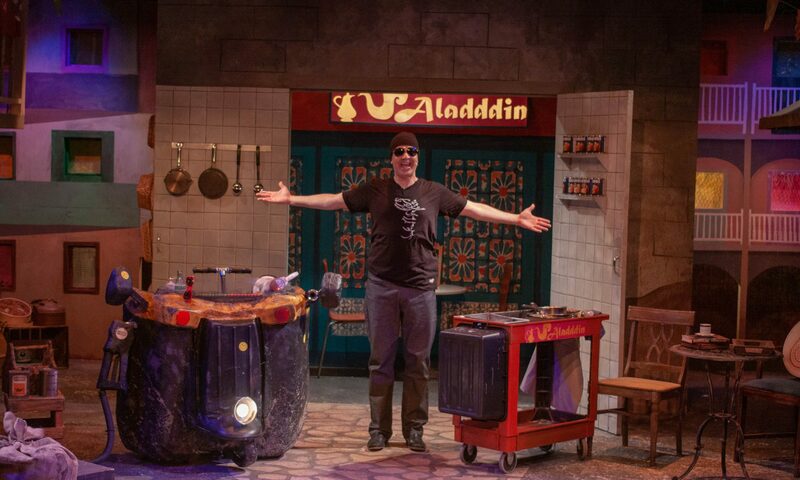 Throughout the show, he accompanies himself with various percussion instruments, and his proficient skill with them gives the show much more shape and drive than his stories. He also takes on personas of people across the Arab world that he’s interviewed, adding and shedding costume pieces and changing his physicality accordingly, and these segments are heartwarming and compelling, though some are slightly too long. In addition, the gorgeous set design from Samia Malik plays a crucial role in giving the show a visual identity. The background is set up to look like an Arab street in miniature, with softly glowing windows and archways. Props and costume pieces (from designers Abigail Cain and Brenda Winstead respectively) are integrated into the set seamlessly, with Nagi removing and replacing certain things throughout the show. And the lights from designer Ellie Humphrys are inspired; hanging decorative lights and stage lights combine to make a lovely reddish-orange glow that brings warmth to the various locations. The supplementary elements are all here, and the heart and drive and social consciousness are here as well. What is missing from Detour Guide is the bones; the script and the performance both feel like a first draft. On glancing at the program, you can see that Karim Nagi’s background is mostly not in theatre, but in music and dance, and this shows in the difference in quality between the two. As a result, this show falls a bit short of its goal. Go see it for the beautiful dancing, music, and design — but the hard work of expanding your mind to other world views? Detour Guide won’t do the heavy lifting for you, and perhaps that’s a good thing. Detour Guide is a co-production from Silk Road Rising and Stage Left Theatre, and runs at Silk Road Rising through April 7th.